We first saw her walk out from under a car near our home – a grease-smudged ball of fluffy whiteness. She was, hands down, the cutest puppy we had ever seen – a tiny thing with little ears, button eyes, and curly tail – a stuffed animal come to life. Her cuteness was almost unbearable. We asked her owner – a mechanic under the same car – if she had any brothers or sisters. He had bought her on a street corner in San Francisco and didn’t know. The following day, overrun by her puppy energy, he offered to sell her to us. I bargained her down to $35 and then brought her home as a surprise for Loveleen. We had a dog! Almost instantly, she captured our hearts. When it came to picking a name, it came to me in a lucid ‘aha.’ My special “pet” name for Loveleen was “My little babushka.” I called her this with much much love and to give it away to this little puppy was no small sacrifice. Sensing her importance to us, the name was bestowed on her… our little Babushka. Babushka was indeed a terror as a puppy, relentlessly yanking on my pant legs and Love’s skirts. She came with us everywhere – even to my construction job. Her first trip in the back of my truck made her pee, poor thing, but soon after she came to love her windy chariot. At the time, I didn’t like leashes. To me they represented control and ownership, and I wanted Babushka to feel free and independent. There were times, I’ll admit, when I screamed out in terror when cars came a little too fast or a little too close, but her childhood was truly fun-filled with adventure and freedom. As a tiny puppy, we never really imagined she would grow to become a big dog, but in her “teenage years”, those little bent ears stood up, her snout popped out and she grew. Our little toy became a big toy – now with wolf-like features. 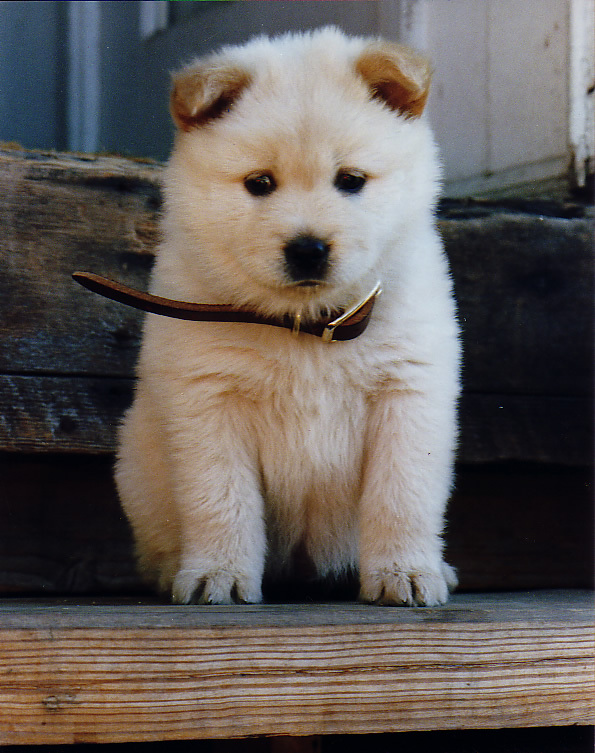 Years later we had her DNA test done and discovered she was an equal four-part mix of Chow Chow, Alaskan Malamute, Akita, and Komondor. That combo, when flooded with love, is how you make a Babushka. The reason I’m writing this is because today, fourteen years later, our little Babushka has moved on. It was hard to know then just how much of a part of us she would become. One of the first astonishing events in her life happened when we left her in the back of Loveleen’s Karmann Ghia one day to quickly go into a store. When we came back, I noticed a wet paw print on the seat. I looked around to see where the wetness had come from. Did she pee in the car? After lots of looking, we found the near impossible. She did indeed pee. She had gone through a mesh net between the back seat and the trunk area into a jar that was tipped at an angle on its side. The jar was filled with pee without any spillage. Not bad for a 3-month old puppy! Good girl! Another miraculous event happened that I shudder to even mention. One day, Loveleen had tied her on the driveway to the back bumper of my truck. It didn’t occur to her that I might drive off without noticing she was tied there, but that’s exactly what happened. I had to leave in a hurry and drove off unaware. Even worse, at this point, not only did we leash Babu because she had become aggressive toward other dogs, but we kept a full body harness around her to keep her from choking herself any time she lunged. I had driven about two blocks before a neighbor waived me to stop and I looked back in cold horror to see Babu’s empty harness dragging from her leash. 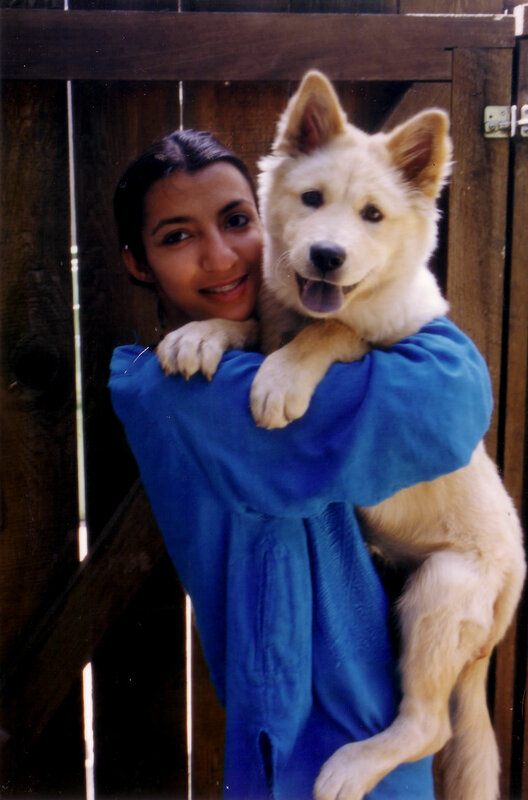 By this time, Babu had become such an integral and beloved part of our lives. It’s hard to convey how much of our love we had entwined with this little being. 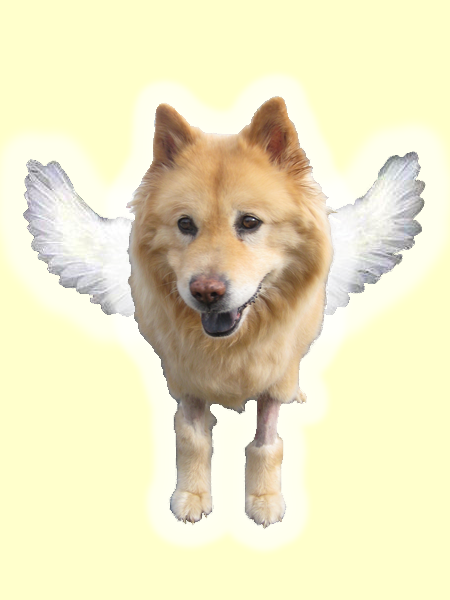 The image of what may have happened to my angel was more horrific than I could ever express. I turned the truck around in horror to face whatever destiny lay waiting. When I got home, there she was! Alive and well, standing with Loveleen in front of our house, wagging her fluffy tail. I ran out to hug her and to receive her long kisses – both of us knowing just how close a call it had been. Loveleen had watched in terror as I drove off with Babu running behind my accelerating truck. That the harness miraculously slipped off her is something hard to explain. As I held my baby girl in deep gratitude, a praying mantis came from nowhere and landed on my hand. Grace. True story. Thank you. But the biggest miracle by far was that for fourteen years we were all able to share a deep and priceless bond of love. I won’t lie. We’ve been good caretakers. 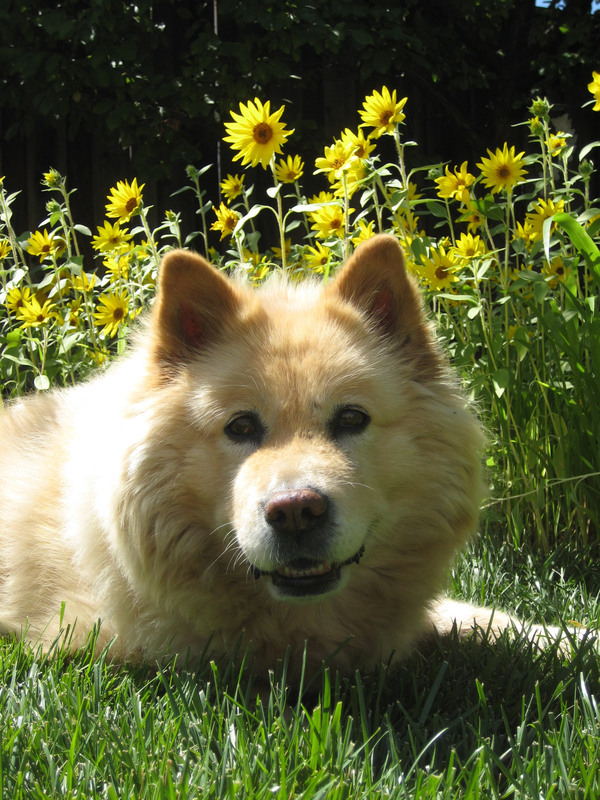 Babu got her walks every day – she was showered with love and treats, and sometimes went for hikes through the redwoods or rolling hills. But what we’ve given to her can never compare to what she gave to us. Babu was a part of our lives. A big part. But we were a much bigger part of hers. She loved us profoundly. Wherever I went, she would follow. Whenever I looked up at her, she would be watching me. 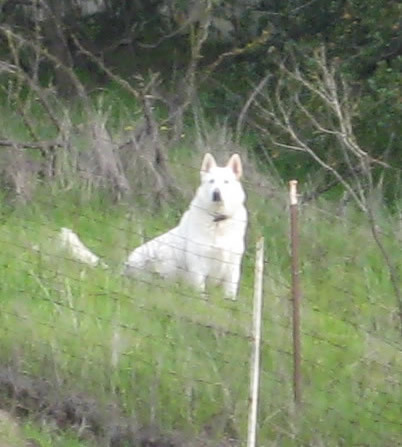 Whenever we drove home, she would be waiting, always overjoyed to see us. Her love was extraordinary. One of my favorite things was getting kisses from her and looking into her innocent eyes while she kissed. Oh my lord, what a precious being. Knowing that she was dying, I made sure to do this often. Though it may sound odd, Babu and I would stare into each others’ eyes while she kissed me – sharing together an exchange of love – two beings radiating all of our love toward one another. The love that flowed was universal and overflowing. In love, we were true equals. Babu was blessed to live a healthy life, though her last month was hard. Most everything began going wrong. Diabetes. Kidney disease. Liver disease. Infections. Seizures. Loss of mobility. No appetite. Through it all, she stayed loving. We did everything we could. If she was to die, we wanted it to end on the right note – in harmony with the beauty and joy of her life. Deciding when to let go is a decision I wish on no one. That we were able to compassionately make this decision is something most take for granted for animals, though it’s a nearly taboo subject for people. This is something that ought to change. It is said that one’s state of mind at the moment of death sets the course for what comes next and is therefore of utmost importance. What matters most is that one’s mind is with love. This dog appeared before us just minutes after Babu's passing. All animals – every one of them – are our kin. We need to respect and treat them as such. Thank you, little Babushka, for all of your love and protection. And thanks to all the beloved beings of the world. Happy 14th Birthday on this Valentine’s Day. We’ll love you forever. Long Live Sandra Trujillo de Moyano! A time comes for all of us to pass; perhaps the best we can hope is to be ready, and go smiling, as Sandra did. Death is big. We each comprise the story or fundamental fabric of one another’s very beings – stories stitched tenderly into our own hearts – with no design for removal, ever. The Story of Sandra is a special one – one that reached its natural conclusion. In her 34 years, she lived fully and completely and lived out her life to its end, having arrived at a state of absolute acceptance. We’ll all miss her immeasurably. In our hearts, miraculously, Sandra doesn’t leave the trauma of an unfinished story – robbed of us before its telling; she leaves instead an exceptional story – one with a happy ending. Strange though it may seem, we are left satisfied, thankful for having had this explosion of joy grace our lives. Sandra celebrated her 34th birthday in style. Friends and family traveled from all across the globe to be in her company – all of us knowing it was her end – and all of us celebrating a Grand Finale… of a life brilliantly lived. Sandra didn’t disappoint, leaving on a high note, with a HOWL! Loved by so many… Come, meet Sandra! During this time, I was deep into dream analysis and mandala making. Through both, I developed keen insight into my own psyche – both in understanding my whole self, and gaining intuition in how to grow and delve deeper. Some time after the operation, both in my dreams and in my mandalas, all evidence suggested that a woman was about to enter my life. In my mandalas, she was portrayed as yellow, and so I was pretty certain that she would be blonde. I was so certain, in fact, that I staked my entire conviction to the legitimacy of my dream and mandala efforts on it. When it actually happened, I wasn’t at all looking for it or even aware that I was anticipating it. It just happened. I was in the Whitney museum in New York City with my mother when I met her and we started talking. Coincidentally, it turned out that she was living strikingly close to our home in Connecticut and so we offered to give her a ride back. Claudia and I became best friends. The unusual thing about Claudia was her beauty. She was from Santiago, Chile, and was so extraordinarily beautiful that it was actually disarming. I remember ringing her doorbell to find her opening it and each time becoming totally mesmerized. We once asked a guy on the street for directions, and his jaw dropped and he stood there stunned, not able to say anything. She was that beautiful. couldn’t overcome rationally, I finally took the plunge, and mechanically kissed her. Very quickly, it became natural, and transformed into something extraordinary. Though best friends, we were very different. I was an artist and wanted to change the world. She wanted an upper middle-class home, with good jobs, and a maid. I knew we weren’t destined to ride into the sunset. Claudia came as an utterly magical gift from the Heavens, and she helped to turn my life around. When stripped down, Thanksgiving is such an amazing holiday. It’s a day built on being thankful. How great is that? And it’s a day to be with family and the ones you love. It’s a day celebrating abundance and sharing. It’s really the only day of the year that no one wants to see anyone – even strangers – be alone or go without. The whole turkey association is barbaric and outdated. Aside from that, it’s a definite keeper. Though my life was rich and meaningful, I lived it almost entirely internally. I had very little real contact with other people and after a prolonged time living this way, the total alienation became too uncomfortable to bear. Something inside of me was crying out for some kind of human connection, for touch, for love. I had lived with gynecomastia for 5 or 6 years. This means I had lived in deep secrecy and shame for all this time. I had endured so much, had carried a heavy burden, and felt like I was finally at a breaking point – I was suffocating. Something had to change. I realized that I needed to break the silence and reveal my secret. Finally the day came where I mustered up all the courage I had and approached my mother. I told her that there was something that I had to say. She listened and waited. The words wouldn’t come out. I had no other option but to force the words out. There was no place to retreat to. But I couldn’t. I just couldn’t. I stood there trying, as the time ticked. She must have understood how important this was to me. She waited. I don’t know how much time passed as I was caught in this stalemate, but we stood there for a long time, until finally I… managed… to… just… barely… get – the – words – out… and finally, finally, finally, they had been expressed. I had told my mother about my chest condition and how traumatic it was for me. I went back to my room and drew a mandala – a wide open circle that went way off the edges of the paper. The dam had been broken. Change was to come. My mother got busy trying to find a solution, and she discovered that an operation was an option. Soon, the operation was over, and I was finally normal again. Well, sort of. Tickle Bugs join the Gift Economy! It’s a great solution, because it feels good to just open everything up and say: ‘please, come and enjoy these books! Don’t worry about the price; pay what makes you feel happy paying.’ There are only a handful of examples of people doing this kind of thing, but it generally seems to work out, the most publicized example possibly being Radiohead’s new album. The real value in the Gift Economy is that the interaction between ‘buyer’ and ‘seller’ becomes more familial. In a family, we rarely charge each other for things. There is a bond that exists and a medium of sharing. Everyone looks out for one another. It’s this same philosophy that brings family economics to society at large. Whether it works or not is anyone’s guess. So far, there are plenty of examples of it working. It’s certainly a noble experiment though, because what you get when it succeeds is a society built around giving and trusting, connected and caring people. For those of you who don’t know, Here Come the Tickle Bugs! was written and illustrated by a good friend of mine named Uncle Sillyhead III. It’s a children’s book that has a tendency of becoming the favorite book in the house, probably because it encourages oodles of unstoppable giggles. I would love to see every kid between the ages of 1 1/2 to 3 grow up with this book. The joy kids get from it is priceless. And it’s a great book for learning to read, up to about age 6. I also encourage everyone to email Unc himself and order a bunch of books to distribute, especially for the holidays. It’s kind of fun when you can have people pay whatever they want. :) His email is Uncle –at– TickleBugs.com. Researchers at the University of Chicago determined that switching to a vegan diet is more effective in countering global warming than switching from a standard American car to a Toyota Prius (in fact, it’s 50 percent more effective). Environmental Defense also recently reported on its Web site that if every American substituted vegetarian food for chicken meat in just one meal per week, the carbon dioxide savings would be the same as if more than half a million cars were taken off U.S. roads. If we ever want to seriously address global warming, we have to acknowledge the catastrophic impact caused by factory farming — wasted resources: land, food, energy, water, rainforest, animal suffering; pollution: feces, water, air, global warming. The only reason factory farming is generally overlooked as a primary cause for global warming is because acknowledging this inconvenient truth would bring a feeling of shame to those not ready to take personal responsibility. And that’s most people. Do you love your planet enough to stop eating animals? We need not parade through the night. There, I have found you too. Between feeling like I’ve had nothing genuine to add and being too engaged to prioritize the blog, not much has happened on this space. But much is happening. There is a constant flow of inspiration here as always. In Ahmedabad, I saw an amazing performance from a school for the once untouchables. They were dressed in such beautiful outfits and their performances were mint. The upscale venue was filled with a few thousand of their parents. All I could think is that things have come a long way in the last 100 years – which is awesome. In Mumbai, I hooked up with my good friends Madhu and Meghna who have brought together a pool of young filmmakers under a group called MAM. The synergy and camaraderie that has emerged is remarkable. One of their first projects was a really ambitious one – partnering with their friend, Ajesh’s, group The Peacock Project to create the Genesis Film Project – where 101 filmmakers were given 101 hours to make films on 101 nonprofits in Mumbai. The project was a huge success both in content, spirit, and widespread attention. They’ve also created an ideal platform to provide a real incentive for more films to be made on NGOs – a real need in the nonprofit community. There is really no end to where they can take this. I was fortunate to arrive just in time for the festival and to spend time with this awesome group. On the surface level, I came here to work on three projects – Seva Café 2.0, Friends Without Borders Round II, and to possibly start up a special school for the underprivileged at the Gandhi Ashram in Delhi. It’s quite a bit to take on in 2 ½ months, and if I weren’t in India, there is no way it would be possible. The other day Loveleen wrote to me and said that birds were making nests in the attic and she needed help getting a birdhouse put up and moving the eggs from the hard-to-access attic to the birdhouse (if that’s the right thing to do). Last year, a few of the birds fell to their death and we didn’t want that to happen again. We both strained to think of who might be able to help her. If she needed the same help here in India, there would be 400 people ready to help within a moment’s notice. At the moment, all of these projects are moving forward – all with great possibility, but leaving not much time to blog. Whatever happens, it’s all ok. Hope to report more as we go. Sandra, the inspirational character behind the LOVE BUTTERFLIES is free from cancer for the third time!!! You go girl! In my life, there have been several “Big Question Marks” – areas of deep curiosity that felt like they needed to be answered, or I would somehow be left feeling incomplete and unsatisfied. In many Eastern philosophies, they talk about letting go, but these are some of the things that feel better fulfilled than dropped — because once they are answered, they are gone. For me, travel was one of those things. I always had a strong, intuitive feeling that I needed to travel as much as I could right away – to satisfy the curiosity – as the opportunity may not always be there. While I was delivering newspapers in Berkeley, I took a break to tour Europe for a month and a half. It felt incredibly liberating and empowering, knowing that all my classmates were still in high school, while I was off exploring the world. I carried my frugality with me to Europe, staying in the cheapest places I could find and eating the cheapest of foods. I decided to splurge once in each country and many of the experiences were pretty comical. For one, I had a romantic notion of France and espresso and wanted to experience it. I laid down the francs for an espresso and felt a bit pained by how small it was for the price. I then indulged and couldn’t believe how horrible it tasted. It was a pretty surprising and disheartening encounter. In Italy, when I felt the urge for a splurge, I entered a charming pizza restaurant in Florence where I carefully studied the menu for the optimal selection. I settled on something that sounded quite poetic – pizza blanca. It turned out to be just a baked pizza crust, with nothing on it. I traveled with great confidence and became quite competent and self-reliant. Maybe six months later, I decided to travel again – this time to India and Nepal. My reason for wanting to go to India was much different from that of most people who yearn to go there. I was only 18, and had heard something about the deep spirituality of India and its sadhus. I had a romantic notion of these sadhus, but instead of going there to seek them out for answers, or perhaps to find a guru, I wanted to discover their flaws in order to humanize them. My experiences in life had been so profound, that I felt that they were my peers. I sensed a tendency within to romanticize them and project on them all of my divine qualities. Instead, I felt that by humanizing them, they would lose their power over me, enabling me to sustain these qualities myself. My first trip to India was extraordinary. It started on the airplane with the thrilling feeling of being surrounded by people from such a rich and very different culture. At the airport I hung out with Tibetan monks until dawn where I caught a bus to the city. On the way there I saw a body floating in the river and a corpse on the street with its head cracked wide open. The poverty was all around – the leper-filled streets, starving families, and scrawny dogs. Though I didn’t know it at the time I had arrived on Diwali and firecrackers were bursting all around. As I gazed into the face of deep poverty I had the sense that finally I had found my home. Though I lived in America, land of the plenty, my own life was full of suffering and deprivation. In seeing this external poverty, I felt that it was the material manifestation of my inner state – something I wasn’t even really aware existed in the world. And it somehow felt very comforting to know I wasn’t totally alone. I felt great compassion all around, and also felt the joys in offering smiling hellos to all the kids and genuine Namastes to all the people I encountered. My own spiritual being naturally blossomed. When I arrived in Banaras, I was so overwhelmed by the density of devotion and layers of spiritual expression that I decided to stay put. I could write quite a bit about my incredible experiences on this trip and also in the pristine and magnificent Nepal. Though I’m sure my own perceptions have changed and been diluted, I really think that India (and Nepal) have changed dramatically over the last 18 years since I first visited. I feel very fortunate to have gone when I did for a taste of this very rich place. My traveling didn’t end here. There has been quite a bit more. Clearly, traveling expands our sense of reality and stretches our own place within it. Though the world is filled with amazing places that I would love to visit, and though I come alive when I travel, this Big Question Mark has already been answered. If I never travel again, I would be satisfied. Traveling broke open the provincial view of myself and the world that I had developed – and that is exactly what I needed to crack. It also gave me a sense of esteem for having tasted of the adventure. Though I love it, the question mark is now gone. I can let it go. From here, traveling is just an added joy. Welcome to life. At some point, each of us is bound to experience profound loss. And we all somehow manage to get through it. I’m not happy about my current situation, but life is what it is. The key is how we deal with it. By posting this now, I am kind of opening myself up, sharing this most difficult process as it happens in real time. For me, there couldn’t be much of a greater loss than losing Loveleen so, if it actually happens, how am I going to deal with it? It’s kind of twisted to say that it’s fortunate I’ve dealt with profound loss before, but I have, and having been through it, I’ve picked up some survival tools. The feelings that will be coming my way are likely to be pretty severe. It’s one thing to talk about how to cope. It’s another thing to do it. I’m sharing these tools with everyone, hoping that maybe it might help you out in similar situations, but it will remain to be seen whether they prove useful to me this time around. will. Sometimes, it may be hard to keep the flame lit, but this is a sure way of doing it. See also my earlier post called “Recipe for Blue Skies”. Rule #2 – Enjoy the process :). In moments of sadness we are exposed to the sweetness of life. Life is not just about smiling and being happy. Life is about savoring our existence and this existence is made up of all kinds of extraordinary experiences, many of them very difficult to go through. Nothing can reveal severe beauty like the pain of loss – here, we are re-living love on its way out. It’s OK to be crushed, but enjoy being crushed, and savor the love for the second time as it makes its departure. When you can learn to appreciate everything – wanted and unwanted – then life just becomes an amazing ride. Rule #3 – Stay true. This is an important part of enjoying the process and the best way to grow with the ride. For me, poetry has always been very helpful in times like these. get through the really tough parts. to grow and take over. Before Leaving Los Angeles, we stopped at “The Garage” – the infamous home of Sukh from Be The Cause. We all spent a little time making Love Butterflies for Iris, a co-worker of Loveleen’s who has just been diagnosed with cancer. Iris, we wish you well! We then went out to lunch at a mostly vegan Vietnamese restaurant called Au Lac. The food was very good and they were super nice. Though we were running a little low on time, everyone agreed to stop at South Central Farm. I’ve been following the story of South Central Farm since I got back and it meant a lot to go there in person. As we drove up and saw the signs, the utter wreckage of this land immediately left us all broken-hearted. South Central Farm was given to the community following the ’92 LA riots and since then it has become a vibrant spot, beaming with life. The South Central Farm is the largest urban farm in America – all organic – and has been a source of food for 350 families. Within this plot of land grew fruit trees and all kinds of plants and veggies, including many rare, heirloom varieties. It has been an oasis – a space where children could play freely, safely watched by a whole community, all gardening together. What’s particularly extraordinary about this space is that it is located in the industrialized area of South Central Los Angeles. The vibrancy and wholesomeness of this spot of Earth comes into clear focus next to the vast, deadened, concrete world surrounding it. This is yet another story of how oftentimes something so clearly right in the world does not always come out the winner. Last week, South Central Farm was mostly bulldozed to the ground despite the heroic efforts of many to stop it. We slipped through the fence and spotted many plants and trees and fruits and vegetables that had survived the brutal assault. We sat down for a moment of silence after being told by a security guard to leave. The emotional crush that we all felt in being here was intense but can’t possibly compare to the crush that everyone who has put so much love and care and energy into this spot must be feeling right now. The poetry of this space is powerful – the beautiful potential of Earth, so evident here – of all places – yet so violated and tenuous. I really think this is an important one to win for the planet. Despite the devastation, this story is not over. Most all the money – 15 million dollars – has astonishingly been raised to buy it back, but due to a misunderstanding, the owner now refuses to sell it. There are court battles going on and hope is still very much alive. I encourage everyone to check out the South Central Farmers’ website and sign up for the e-newsletter to stay up to date on its progress. Seva Café opens in Long Beach, California! Something beautiful this way comes. Five of us drove from the Bay Area to Long Beach to be part of the opening of the first Seva Café here in the States and the second in existence. After a life-altering service vacation to India, the folks from Be The Cause were so moved by the overwhelming generosity they received that they wanted to plant some of that giving spirit in the ground right where they lived – in Los Angeles. They spent time at the Seva Café in Ahmedabad and fell in love with the overwhelmingly positive energy and culture of giving that they experienced there. When Sri, who wasn’t even present on the India trip, insisted that this must come to LA, the others all rallied behind him to take this extraordinary step. The Seva Café is no ordinary restaurant. Business operates anything but “as usual” here as your meal has already been paid for by a previous guest and the bill that comes to your table says “Total: $0.” Seva Café is a shift to a “gift economy” where those who are serving you are doing so because they recognize that it is in serving others that we grow in spirit and in happiness. The place is full of love and you can feel it. It is a celebration of giving and care for others. The beauty of this experiment is that it can only continue if the circle of giving is completed – which requires that guests also join into the spirit of giving and “pay from their heart” – to allow future guests the opportunity to experience this as well. If it doesn’t happen – if people choose not to support it – then it will cease to exist. But for as long as people keep the chain of giving in motion, we all get to experience a taste of a better world that is possible. Another beautiful byproduct that comes out of such a venture is that it tends to create a community around it. People love coming to the Seva Café because it is such a positive environment. Within this space seeds of service are planted and watered and begin to grow, and before long, an organic service movement is taking root. The trust and responsibilities of taking on a project like this are enormous, but the fruits are exquisite. Be The Cause took a brilliant, low-risk approach in opening the café. For each Saturday, for the next three months, they are simply taking over an existing restaurant, slightly modifying the menu and atmosphere. By renting it weekly, rather than investing in a new establishment – they can try it out and see how it goes. By setting a time frame of three months, they can test it thoroughly and evaluate whether it is something that is to be continued or simply a worthwhile experiment and adventure that they were able to experience. When we arrived, we were amazed by the level of organization and preparation that had taken place and more importantly by the amount of love and care that had been put into all the details. For instance, just like in Ahmedabad, they had created a box for community money. Anyone can put money into this box or take money out of it. Simple as that. I took a peak into this community box and spotted a $20 bill and more money that people had invested into this new community of giving. Many of the details from the Seva Café in Ahmedabad were revived in Long Beach, like the characteristic flowers and vines that adorn all the signage. We worked with them to help set up and then everyone went out into the community to clean up the neighborhood – simply to put out some good energy before getting started – by picking up trash, cleaning store windows, washing public mailboxes and trashcans, etc. From opening hour to closing, the place was packed. There were so many stories of people moved by the experience that I could go on and on. Everyone served in harmony as part of a deeper, collective understanding and treated the guests with such care. All I can say is that this small group of people masterfully pulled it off and I am just still in awe that they have done it. Wow. Even the word “wow” has a new meaning now, given by one of the guests, a young Ethiopian woman who was deaf. She came in and sat down, reluctant to participate, but after being gently pulled into the spirit, her happiness was palpable as her grin became one of the biggest I’ve ever seen – stretching from ear to ear – for the entire evening, as she taught sign language (such as “Wow”) to everyone interested. You may remember the blog story from a year ago called “The Butterfly Affect” about my friend Sandra, who triumphed over cancer. There is a great story of how – as a way to lift her spirits – we printed out Love Butterflies and had friends and random people color them and write encouraging messages on the backs. Through an anonymous act of kindness, I was given a plane ticket to deliver these Love Butterflies to Sandra in person. She loved them and they were attached all over her ceiling as a constant source of good energy. Sandra miraculously beat the odds and continued this tradition, going to schools and getting kids to make Love Butterflies for other cancer patients. Yesterday morning, I just got the news that after two beautiful, cancer-free years, it has returned again for the third time. 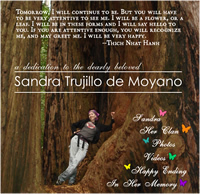 In honor of Sandra’s extraordinary spirit, this idea now has a simple website wrapped around it that can hopefully spread this life-affirming practice far and wide, allowing many more spirits to be lifted high at times when it is most needed. Please visit: www.LoveButterflies.org – help spread the word… and try it sometime. It really is a beautiful thing to do. restored their hope in the world. How many 9/10 year olds would give up all their birthday gifts to do something so caring? When my friend, Nirali, heard this, she decided she wanted to donate something also, and sent along a special email to Nora. It’s my hunch that if enough people were to follow Nirali’s lead and contribute just a little to the WWF and also send an email of appreciation to Nora, it may help to boost her esteem in all the right ways. Did I mention they’re also having a kamikaze bouncy house at this party? I came back to the US without any agendas. I figured I would figure it out once I arrived. I gave myself some time to recover, some time to be present with Loveleen, some time to just be. In the absence of any structure or guidance, I found myself reverting to some old habits. I looked at my first naked chick pictures on the internet in well over a year, I slept a lot, I avoided the incredible pile up of work that was waiting for me from Friends Without Borders. Very shortly after arriving, I picked up the book Siddhartha by Herman Hesse and started reading it. It had been many years since I first read it and it was actually very different from what I had remembered. It was very difficult watching Siddhartha lose himself after cultivating such an extraordinary spirit. In the story, he is very casual about the choices he made, saying that they allowed him to awaken naturally and know the limitations to surface living in a genuine way, without dogma. And his experience seemed to be very parallel to what I found myself falling into the first weeks back in the US. Without direction, I wasn’t going anywhere. I could easily see how this could spiral into depression and addiction, etc. Fortunately, for me, the need for some kind of compass was very clear, and I don’t feel I will drift very far. A compass is something that ensures that your spirit is lit and exercised. We are surrounded by all kinds of temptations that seem attractive, but will only bring us misery in the long run. Though they are often flawed, religion, spirituality, or at least some kind of engagement with the world can keep us moving through life in a healthy way. I guess for me, I tend to recreate my compasses all the time. Presently, I don’t yet have one, but it’s likely, when I find it, the needle will be pointing your direction. I’m back in the US. In terms of the blog, I’m not sure what that means. I named the blog “To Be True,” implying that I would keep things real. I have a lot more to say, but to write about what’s real is often difficult because things are sometimes too real… and too personal… to talk about openly. But to avoid these big things is to stray from the essential. Since the age of 17, I have always carried with me the gut knowledge to avoid getting nested. This knowing, though strong, was never validated by my life. As much as I knew to avoid long-term commitments like pets, debts, and children, there never seemed to be a justified reason why. It just seemed like an irrational fear or eccentricity and over the years, with little compromises here and there, I ended up somewhat nested, but not totally. This trip to India gave me the first validation that there was something to my internal knowing. Having to leave behind Loveleen, Babushka, and Luna for so long was a difficult thing to do in so many ways – not to mention all the other commitments and responsibilities that needed attending to. I took that difficult step and did the best I could to make everything work out. But it was sometimes hard on Loveleen. I have always been open to having a child, though it never seemed quite right. If I did, I would want to make the child my life’s primary focus and in doing this, I would make an incredible father. I would love my child as much as any father has ever loved his child. Being a good father, however, would require a complete reversal of everything I have built my life on. Raising a child in America – the way I would want – is not easy. Our isolated lifestyles in America are good for cultivating the benefits of self-development, but not good for providing the “village” required to raise the happiest children. And maybe it’s just me, but I find the public schools in America often to be hell-holes. Loveleen’s biological clock is ticking and for a long time, she has wanted a family. I think Loveleen would make the best mother of all time. One of my strongest tendencies is to want to fulfill people’s dreams, but this one is tricky. By fulfilling her dream, I become nested. And what that means is that my ability to give my all in whatever way needed becomes seriously compromised by my needing to be present to the new, long-term needs on hand. If I tried to continue on course – and be a dad – I would end up being an absent father. Very often, very caring and dedicated people like Einstein, Gandhi, or John Lennon, just don’t make good parents because they spend all their resources elsewhere. This is my big fear. Several days before leaving India, I became sick. I developed a high fever and slept a lot. Perhaps, I thought, this was a result of an easing of all of the responsibilities I had held for so long. The plane ride home was long. The greeting I got at the airport from friends was very sweet, and then I spent the next few days still recovering. Certain blisters I had gotten in India were getting more and more infected and the bacteria entered my bloodstream and became life-threatening. It’s likely I had a staph infection. Once again, antibiotics saved the day. The hardest part about arriving, however, was when Loveleen started talking about breaking up in a very serious way. She is very understanding and eloquent, and said she has to come to terms with the idea of me not wanting to have a family. It’s not that I don’t want a child. How incredibly amazing would that be? It’s that my gut is warning me – it’s telling me to remain free so that I can serve unbound. The thought of losing Loveleen deflates my spirit to zero. At Jallianwala Bagh in Amritsar, we had a candlelight ceremony, with the intention of decompressing after such an uphill climb and with the intention of bringing love to a place historically hit with such pain. Again, we were given full access to the space. The following day, we headed out on foot toward the border. Our team – Yoo-Mi, Mark, Jocelyn, Loveleen, Vandana, Avani, Marielle, Roberta, Raj, and I – walked for two days along with “The World’s Largest Love Letter,” and thousands of letters from Indian kids, all carried on six bicycle rickshaws. When we got to the border, our visas had not been granted yet and so we had to wait. The timing of the delay, however, seemed synchronistic as it happened to coincide with the official launching of the IndoPak Peace Bus. Prime Minister Singh himself was coming up to Amritsar to see it off. In our characteristic style, we managed to finesse a press release from the Prime Minister, thanking the children of India for participating in this letter-writing program, and also thanking Friends Without Borders for making it happen. Although the timing seemed perfect, we later found out that our visas which had finally been granted could not be picked up because it was a Pakistani holiday and the embassy was closed. Our time to set up for our huge event in Lahore was becoming seriously jeopardized. In our characteristic style, however…back in Delhi… Maria did the only thing she could – she found out where the employees of the embassy were living and went to their quarters. With a few tears, the doors were opened, the visas delivered, and Maria hopped on a plane for Amritsar and joined us, as we crossed the border just on the tail of the Peace Bus. At Wagah Border, we pulled out a border piece from “The Love Letter” and laid it out for the waiting media to enjoy. It took 45 Indian and Pakistani porters to carry The Love Letter across the border and they all did it voluntarily, in spirit of the mission behind it. When we finally crossed, due to the delays and due to some rain, much of the crowds that had been planning to greet our arrival had dissipated. Still, Aamir Rafique, of the Goethe Zentrum German Cultural Center, who was spearheading the Friends Without Borders effort in Pakistan, was there with reporters, TV crews, a live band and some friends, including a team of pretty, young Pakistani women. Our entry was a joyous and jubilant celebration. Though we planned to walk to Lahore, our time had now become shortened significantly and so we were whisked to our new headquarters, ready to begin our humble little Tour d’Pakistan. The end of my time in India is quickly closing in. People keep asking me how I’m going to be able to deal with the transition. It’s a question a lot of people here are also asking themselves. In many ways, I feel pretty fortunate in that I have an answer and am prepared for the change. In many ways, I clearly have found a niche here in India. I can bring a lot of positive change. I’m sure the same is true everywhere, but here in particular, it seems to be within grasp. India is alive in ways that America is not. It’s a place that awakens something within. I am startled by the broad changes that have taken place here since my first trip back in 1988, I think. The deep base of spirituality which used to be so pervasive is being replaced with the same materialism that has robbed America of its life. Probably the largest motive behind my coming to India was to do what I could to help protect this blessed spirituality that I sensed was in peril. For better or worse, I have let go and am accepting the changes as they come. If India is to lose her spirituality, then perhaps it will emerge in another place. All we can ever really do is try to keep our own internal flames lit as brightly as possible and work to bring positive change wherever we are. I think India is positioned to become the next world leader. It is only a matter of time. As it matures into this position, one can only hope that the undercurrents of spirit will come along, and I am pretty certain that these currents run deep enough that the world is in good hands. The way I have come to terms with my own transition back to the States is in my understanding that it really all does come back to being true to yourself. This is the constant that is always present wherever you find yourself. We can’t always control our circumstances, but we can always keep ourselves in check within our ever-changing surroundings, reaching in to that which is most genuine and offering that sincerity as a gift. I was explaining this thought to someone here in Ahmedabad and she said that it’s hard because so many people have expectations of us and to be true means to go against the many expectations of others. I told her that the challenging feelings and sensations we face in these situations is actually the experience of the world itself changing. In boldly staying real in these situations, we are taking on the karma of the world and bringing about change for the better. Besides, our fears are often misguided and in challenging them, often it yields unexpected positive results – in time eliciting respect and appreciation and allowing others to follow along the same lines with less difficulty. In high school, my friend Charlie and I drove around town as fast as we could and swore we would always live life on the edge. I haven’t been in touch with Charlie much in the last few years, but from what I know, I think he has mostly kept his promise… as have I. Right now, we are on the edge of many things. When Mark Peters and I first learned we had to leave the country, we chose Pakistan because it was the most challenging place for us to go. On the whole, Americans were not looked upon very fondly, and there was a very real threat of danger in going there. We chose Pakistan because this was the path with an edge. Change doesn’t come about by avoiding our fears, but only in entering them and working to improve and strengthen the situations therein. After having spent so much time collecting so many good wishes, I have developed a greater sense of the inherent goodness of all. I no longer have any fears of entering into Pakistan. When Mark and I first talked about going there, we talked about going in and getting out, as quickly and as covertly as possible, dropping our love bomb and leaving before we became targets. Now, a group of us are all walking in as huge national news stories. Our story is literally everywhere. From newspapers all over the country to large magazines like India Today, bits and pieces of our work are recognized now by most people we encounter. Both the President and Prime Minister of India are intimately aware of our work and just today, The Dawn, the largest newspaper in Lahore, Pakistan, ran our story as its main, front page feature, with full color photo and all. By no means are we going in covertly; we are walking in – literally – pushing the letters from Amritsar to Lahore – with every spotlight on us. And we are unafraid. Plans are already in the works for the continued buildup of this project after Pakistan. This effort has an energy of its own, and to me it feels as if we are simply being pulled along to take care of its details to the best of our abilities. Following Pakistan, most of us will be returning to the US, but will continue to nurture this forward. From Mumbai, we headed up to Ahmedabad for an unsual event celebrating the unity within diversity. From different places of worship (Hindu Temple, Jain Temple, Muslim Masjid, Christian Church, Sikh Gurudwara, Jewish Synagogue, and Parsi Agyari), kids gathered from various backgrounds. Five massive strips of Hindi text from “The World’s Largest Love Letter” were marched down the congested streets of Ahmedabad in a bold visual display – each strip requiring 60 kids to carry it. The strips all ended up at the Gandhi Ashram, where an event took place, with approximately 1500 kids there to sign the border pieces, read aloud their letters, and join in a dance celebration. The historic ashram buildings were all wrapped entirely by the massive colorful banners – newly painted by HB Kapadia school as well as the Ashramshala kids of Manav Sadhna. As always, the ever-giving folks at Manav Sadhna, demonstrated nothing but the humblest of heroism, playing a pivotal role in orchestrating this amazing production in just a matter of days. They even fed the kids! After the Ahmedabad event, we all hopped in our bus fully adorned with children’s artwork. This bus was loaned to us by the trucking company Mahindra and Mahindra, along with two trucks, also fully decorated in children’s art. From Ahmedabad, we drove to Kutch, in Western Gujarat, where we stopped in remote villages along the border route, to collect letters from kids in rural areas. The purpose was both to have a fun road trip and also to demonstrate that this is about all of India – rich, poor, urban, rural – no matter the place or background of a child, they are all included in our project. In truth, this whole effort is only superficially about India and Pakistan. It is about recognizing the potential connections inherent between all beings, and taking the necessary steps to develop those connections. Along the journey, in a remote Muslim village, I was surprised to find the village all lit up with dozens of diyas – a sight very rare in a Muslim village –a surprise for my birthday. It was truly beautiful and something I’ll always remember. We drove through Rajasthan to Delhi, where we took care of a few more things necessary to make this campaign grow, and then we headed to Haryana and Punjab, where we stopped at more rural schools, including the one next to Loveleen’s family village, where we had the treat of stopping along the way. With so much activity, there has never been much downtime. It’s amazing we’ve been able to go like this for so long and stay so positive. What we are working on is just so simple and special that it seems to somehow keep us sane and upbeat – despite the challenging conditions. What an amazing trip it’s been. I just got an email from someone I’ve never met who has been reading this blog and says that reading it has helped keep her inspired in her own service work with “at risk” adolescents. I started to write her back and then it occurred to me that what I was going to say was pretty relevant and that I should probably write it here instead. In life there are many different types of service. Some types – like what we are doing now – may be seen as big and rewarding. Other types – like what she is doing – are difficult, unglamorous, and may at times even seem like a losing battle. I realized long ago that we’ve all been dealt different hands in life and to judge one’s merits on the superficial size of one’s accomplishments is not a real indication of success. Success can only be measured in the moment, relevant to how you respond to the conditions on hand. Right now, I’ve got enough money to keep going on this project. I have a computer and web access. I am a white male in a country where that has value. I grew up in a good school system. I am healthy. I have the right conditions to take on things that one may not be able to take on in the face of poverty, sickness, learning disabilities, discrimination, etc. Service has two components to it: 1) you try to make a positive difference, and 2) by humbling ourselves in the process of trying to make a difference, we can blossom spiritually. One can work to make a difference by spending years trying to get an autistic child to tune in or by spending years trying to change a law that will affect millions. Both courses are equally valid – they are both ‘The Work’ that needs to be done in our world, and it’s only through our own hearts that we can measure what work feels most important for us to take on. Just last night, I met four young boys inhaling solvents on the streets of Delhi. This problem is huge with kids in the cities of India. They are all starved for love and it seems like with enough love and support, they would quickly let go of this habit. I tried talking with them for a while and then put Loveleen on the phone to speak with them in Hindi. We made a minor difference, but to make a real difference, I would have to stop this project and focus on these kids. Wherever we go, there are millions of areas where love and attention is needed and to walk away is always difficult. There is no right path. It is in choosing something – anything – and applying our care to it that we can and will make a difference. What’s important is to keep growing in love and humility and to keep engaging in positive transformation. As far as growing spiritually in the process, in many ways the less rewarding work is the greater type of work, because through its challenges, the pearl comes more quickly, where in the reward-filled work, ego traps are all around. Earlier in the year, I posted opportunities for people to contribute to my blog so that I could do acts of kindness for them here in India. A long while back I started spending more and more money. It started in transportation to and around different cities, visiting schools, etc., then in buying markers and paper for school kids to write friendship letters to kids in Pakistan, and then went on to fund thousands of dollars worth of “The World’s Largest Love Letter” and public service announcements. I operated with faith that by not holding back and moving forward into the beauty that the money would eventually follow. Because of this faith that the money would come, I held onto the idea that I would keep the money that had come in through the blog for small acts of kindness instead of using it on this project. Some friends have come forward and helped out in very generous ways, but overall it’s not looking like we will find a big sponsor for this project. If you donated anything to me through this blog, it’s probably a good time to say that it has been invested into “a brand new approach to world peace,” and I feel very content knowing that your money was very well placed. I heard recently that the American war in Iraq is costing $100,000 every minute. Do you have any idea how much money this is? And all it is buying is a whole lot of chaos and aching resentments that will take generations to heal. On their scale, the cost of our project may equate to about 15 seconds total, and I feel pretty confident that with just a handful of people and a network of support, we have accomplished much more. There were times on this project where it would have been very easy to stop everything as the costs became hard to bear individually – especially from someone who spends his life doing unpaid service work – whose wife earns money doing social work. But when looking at the comparative cost and seeing how much it would buy, it is a bargain of bargains, and to stop out of fear would be tragic. This project has touched the lives of hundreds of thousands of children and adults – probably now millions – throughout India and abroad and it is still very much growing. Its success cannot be measured by just the letters we receive, but in each and every child we have met, and the overall spirit of love and friendship that has gone out into the world. This truly is a recipe for a better world and where its ripples will reach, no one can know. Thanks to each of you for trusting in me with your money and you need to know that in a very real way, it is your contributions that have helped make this dream a reality. Gopi’s. It took me about 2 hours to get there through traffic. From there, I quickly had to get to the other side of town to change my airline tickets back home. This took me a couple more hours. I quickly got a taste of what was going to be a dominant element – with all its congestion, getting about in Mumbai is like moving through molasses. We had so much to accomplish in Bombay and I quickly got to work. Almost immediately we got two big thumbs up for the use of both Wankhede and Brabourne Cricket Stadiums. When we later decided to change the date, however, both stadium bookings fell through and from that point, so much of our time was spent either campaigning to get the stadiums again or looking for alternative venues. Our overall goal was to get celebrity support for our project, particularly during the big event. Through a contact of our friend Meghna’s, I got the mobile number of just about every superstar in Bollywood. Without a venue, however, it was hard to sound credible and much of what we could have been moving forward with had to be delayed. The public service announcement was set in motion almost immediately. Working with Buddy and Black Magic was a treat. They did a phenomenal job. I met up on day one with Jocelyn, a new volunteer who had come to Bombay specifically to work with us. She was great. A little later, Mark and Yoo-mi, Maria, and Smita all came to town. Eventually, we were given a place to stay in a part of town far, far away. From there, a typical day would consist of fighting to squeeze onto a local train ridiculously overstuffed with a dense mass of sweaty men, and then working to prioritize and take on an endless ‘to-do’ list where every item on it was absolutely priority number one. Everything involved personal meetings all over town and only about four or five meetings at most could take place in any day – if lucky. We spent our time trying to get venues, funding, celebrities, artists, etc, etc., and so much more. Food and sleep were placed on hold for months, but what an amazing experience. My corporate hairstyle had grown in and I held onto it as long as I could. With more time, it’s likely we could have turned this into the biggest thing in decades, but we raced forward, all knowing our personal lives would fall apart if we delayed. In the end, one of the most popular Indian bands, Aasma, agreed to play for free, and several big stars said they would try to show up. For various reasons, many of these things fell apart, but the event was a huge success anyway. The emcee, a TV celebrity named Nasir Kazi, from the hit show Kyunki held the event together beautifully. In Bombay, we had the amazing privilege of working together with so many inspiring, kindred spirits. There are just too many to mention here, but overall it was just such a truly rich, beautiful, and memorable experience. There really are probably hundreds of fascinating stories buried within this one blog entry. In the end, we did walk away with one big celebrity agreeing to work with us on a second public service announcement, and we are pretty certain if this happens, many others will follow. I am working hard to nurture this and make it happen while on the road now in other parts. Also check out the 30-second version of our Public Service Announcement. I have things to say before I check off of this planet. In many ways, I was hoping to say these things and be done with them during the period that this Indian adventure was unfolding. It’s not looking like I will have the chance to say everything however, so this blog will likely have to continue.